Forget about the disastrous roll out of Healthcare.gov, how about the even more disastrous Spanish version of Healthcare.gov. 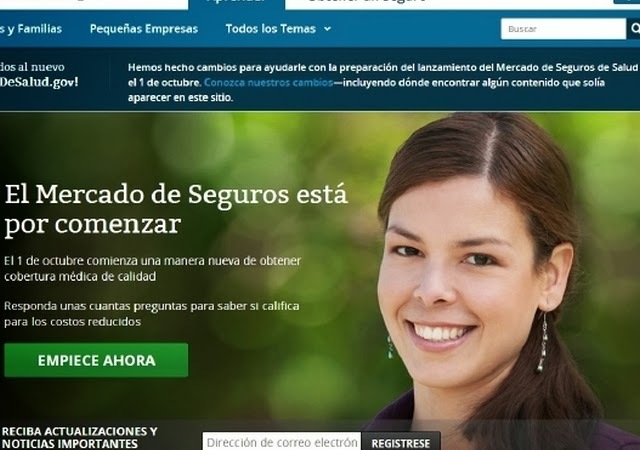 This was a good idea to have the health care exchange web site available for Spanish speaking American citizens. But as bad a disaster as the healthcare.gov web site roll out was, the Spanish version didn't even roll out until more than two months late. That's not even the worst part of it. Now that the Spanish version, Ciudadodesalud.gov has finally come out, it is hard for Spanish speaking Americans to even operate on this web site. From FoxNews.com: "the translations were so clunky and full of grammatical mistakes that critics say they must have been computer-generated -- the name of the site itself can literally be read "for the caution of health. ""When you get into the details of the plans, it's not all written in Spanish. It's written in Spanglish, so we end up having to translate it for them," said Adrian Madriz, a health care navigator who helps with enrollment in Miami." "In my opinion, the website doesn't work," said Grettl Diaz, a 37-year-old Miami gas station cashier who is originally from Cuba. Diaz said she tried to sign up at home using CuidadoDeSalud.gov. After she couldn't get the website to accept a scanned document, she called the government's Spanish hotline seeking help. However, she was repeatedly told to call back because the site was down. She got through days later and waited over an hour for an operator before she was ultimately disconnected. "I'm very frustrated," she said through a translator this month. "I've spent at least one week on the phone, and I couldn't get it done." As for the language, Plaza, the New Mexico professor, said a recent examination by her research students concluded that the translations were done "by a computer-generated process" and came across as awkward. "There are problems with the verbs and word order that make sentences hard to understand," said Plaza, who helped develop an audio version to help residents in New Mexico sign up. "Sometimes," she added, "it's just the terms they use." The website translates "premium" into "prima," but that Spanish word is more commonly used to mean a female cousin, Plaza said. A more accurate translation, she said, would be "cuotas," "couta mensual" or "costo annual." That is what happens when you give the federal government a job of setting up a program designed for the private sector. They will bungle it 99.99% of the time. Now let's compare that to an example of how the private sector works to make and use translation for their business. Edd Hendee, a local talk radio host in Houston, Texas and owner of the Taste of Texas Restaurant [specializing in great steaks] related how he would never use a cheap computer generated method of translation for his customers because he knows in many instances he probably would be embarrassed by the results. Edd, explained that his restaurant gets many visitors in his restaurant from other countries, either coming to Houston on a business convention or coming as tourists. So, Edd said he knew he needed to have a menu available for those many other than English speaking customers. Edd didn't try to find a cheap way out; he said he went to the best translation firm he could find to make his menu available in 13 different languages. Edd says for example when a business group comes in his restaurant with many visitors from different countries, he will have his staff ask them what their preferred language is and he will give each person their own menu in that language [and presented in a very nice way] that they can take home with them as a gift. He says the faces of the people light up and it is like they have been given a bar of gold. Edd said, yes "I could have done it like the government and saved a lot of money, but the results would have been disastrous like the Spanish version of health care.gov has turned out to be. And then when the customers looked at some of the mangled translated words, they would have laughed at me instead of thanking me profusely." Think about that, the federal government couldn't even translate one language right on their web site, but a private citizen entrepreneur was able to successfully translate 13 languages perfectly for his customers. And it didn't take years to do it. To me this is a perfect example of private sector excellence vs federal government failure.